A big THANKS goes out to Mountain Mama for nominating me for this award! So exciting!!! 1. Thank and link back to the person (or people) who passed this award on to you. 4. 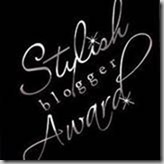 Contact those bloggers and tell them about the award. I LOVE to pack up Christmas decorations because that means I get to reorganize all the boxes! I know. I have serious issues! I love the smell of a newborn baby's head. I wish I could bottle it up and smell it whenever I want! The story of the Samaritan woman in the Bible transformed my life. Thank you Lord Jesus for your unconditional love for me. Thank you! I feel so special;) God bless!